With card reveals for Hearthstone's Kobolds & Catacombs expansion set to begin this week, Shacknews is getting the ball rolling with our card analyses by revisiting BlizzCon. As is tradition, Shacknews is breaking down the cards by the batch. But before the reveals begin in earnest, it's a good time to catch up with what's already been revealed at BlizzCon. We've already analyzed Marin the Fox, but now let's take a look at the other cards revealed during the convention. Analysis: Here's another new mechanic being introduced to Hearthstone. It's the idea of the upgradable spell. 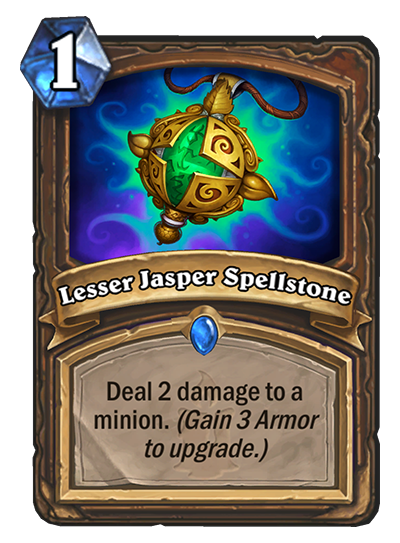 In the case of this Druid spell, the Lesser Jasper Spellstone is a mere Arcane Shot/Holy Smite that effects a minion. By itself, that's a perfectly serviceable early game spell. But the Spellstone becomes much more effective as the Druid gains Armor. And the thing to note is, it's very easy for the Druid to gain Armor over the course of the game. In fact, if the Druid player can hang on to this spell through the end of the game, it's entirely possible to pull off an Ultimate Infestation/Innervate/Greater Jasper Spellstone combo to devastate the opponent's board. This has potential to be a Druid staple going forward and should act as one of the class' most reliable board control tools. Analysis: I'm a sucker for cards that challenge players to position their monsters correctly. Unfortunately, this Hunter card isn't a very good one. It's way too expensive and leaves the Hunter player languishing against zoo decks, which have found a renewed prominence with the rise of Prince Keleseth decks. It also won't stand up to those Shaman decks still boasting Doppelgangster and Evolve. And lord knows it won't do much against those Jade Druid decks. This spell gets even worse if the opponent sees it coming and positions their stronger monsters in the center. Hunter needs some more reliable removal spells than Deadly Shot, but this won't be it. Analysis: The jury's out on the new Recruit keyword and its general effectiveness. For this particular card, it had better be effective to justify its 6 mana cost. That's ultimately going to depend on the deck construction. And given that the Hearthstone developers in their recent interview with Shacknews pointed to a Recruit Warrior deck type, there seems to be more to this than meets the eye. For now, the most effective card here would be Grommash Hellscream. A 6-cost Grommash could do some heavy damage. Other potential candidates include Ysera and The Lich King. But unless the deck is exclusively big bodies, this is still a high-risk play. Unless Control Warrior makes a big comeback, it's hard to imagine this card find a home in Warrior decks. Analysis: Those are some amazingly weak stats for a 5-cost minion. The Guild Recruiter isn't without uses, especially if it pulls out a Taunt or Charge minion. But the fact that Recruit doesn't active Battlecries makes it a mechanic worth thinking twice about. Off the top of my head, I can think of Warlocks that are looking to bring out something like Darkshire Councilman, Flame Imp, or even something like Lakkari Felhound without the cripping drawback. 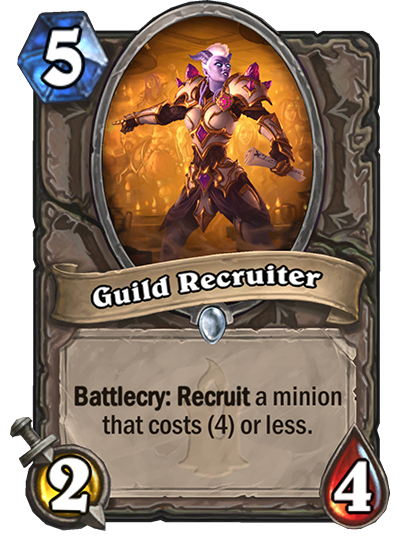 There are some heavy limits to the Guild Recruiter's effectiveness, but it's not impossible to turn this into something positive. Still, I wouldn't expect it to see a lot of play. Analysis: Here's the other upgradable spell that was revealed at BlizzCon. While the Druid spell has its utilities at any stage in the game, the Shaman spell is only worthwhile in its upgraded form. 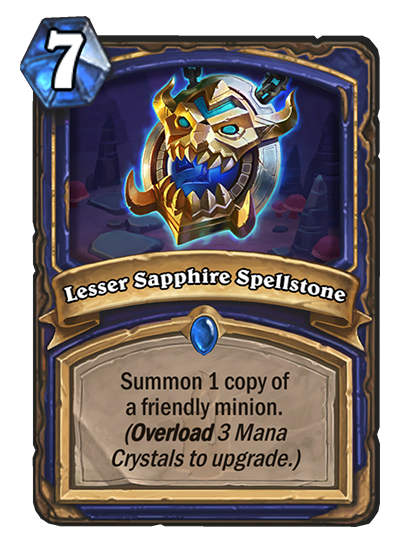 A copy spell for 7 mana is way too expensive, but making three copies can be a game-changer, especially in the later turns. I don't expect to see this used widely, but I do expect to see it periodically. Shaman has an ample amount of control spells, with Lightning Storm and Volcano that can set the table for the upgraded Spellstones. That will allow the Shaman player to lay down a Giant rush, potentially hitting the board with Snowfury Giant, Arcane Giant, and maybe even Sea Giant, depending on the situation. There's room for experimentation here. Elixir of Hope: Deathrattle: Return this minion to your hand. Elixir of Shadows: Summon a 1/1 copy of it. 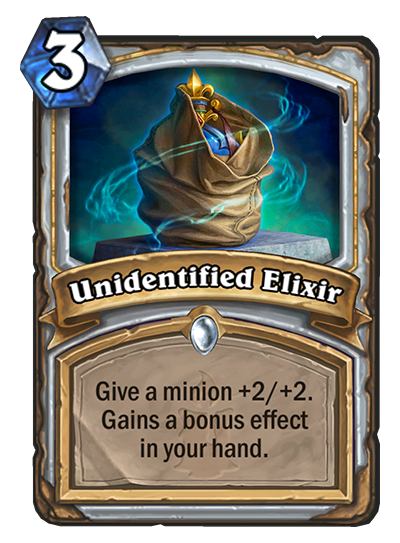 Analysis: This one's tough to analyze, because the Unidentified Elixir's usefulness ultimately depends on the random effect it generates in the player's hand. So looking strictly at the +2/+2 buff, the effect for this cost is decent. However, I wouldn't trade Kabal Talon Priest for this anytime soon. However, this spell will likely find a home in the Big Body Priest deck, where the main goal is playing mostly spells with a handful of giant bodies, like Ysera, The Lich King, and Obsidian Statue. It's a useful buff to any of these minions, especially ones that are brought back to life by Eternal Servitude. Taunt. Deathrattle: Add 'The First Seal' to your hand. (5) The First Seal: Summon a 2/2 Demon. Add 'The Second Seal' to your hand. (5) The Second Seal: Summon a 3/3 Demon. Add 'The Third Seal' to your hand. (5) The Third Seal: Summon a 4/4 Demon. Add 'The Fourth Seal' to your hand. (5) The Fourth Seal: Summon a 5/5 Demon. Add 'The Final Seal' to your hand. (5) The Final Seal: Summon a 6/6 Demon. 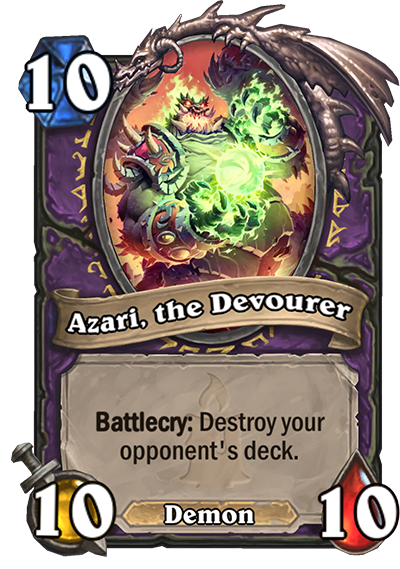 Add 'Azari, the Devourer' to your hand. Analysis: Look at all those steps. Just look at how many steps between "Rin" and "Azari." So many steps! Let's put it this way. If a Warlock player is able to complete all of these steps without dying first, Azari isn't going to have much of a deck to destroy. The opponent should already be close to fatigue and if the opponent is a Dead Man's Hand Warrior or a Jade Druid, the opponent is probably already leading at that point anyway. 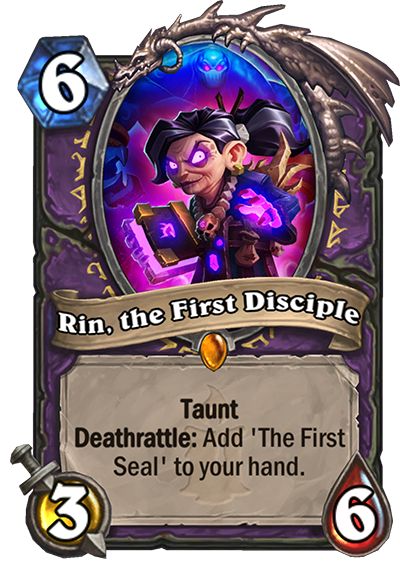 Unless there's a drastic shortcut in the next batch of card reveals, it's really tough to see Rin, the First Disciple working. And Warlocks aren't about to practice that level of patience when Prince Keleseth decks have made Aggro Warlock fun again. Battlecry: Destroy a friendly minion. Deathrattle: Summon 2 copies of it. 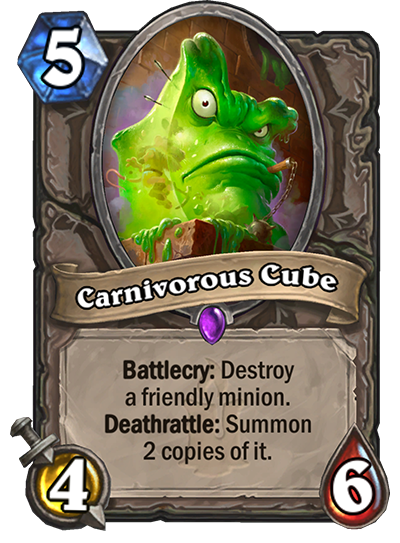 Analysis: Now this is a killer card and one that's going to become a major staple of a lot of Deathrattle decks. It's tough to gauge which of the classes will benefit the most from this, but Hunter's myriad of Deathrattle beasts are going to have a lot of fun with this guy. Even something as small as Kindly Grandmother becomes more of a threat when it comes back twofold. Warlocks and Priest can use this to play the long game with Mistress of Mixtures. 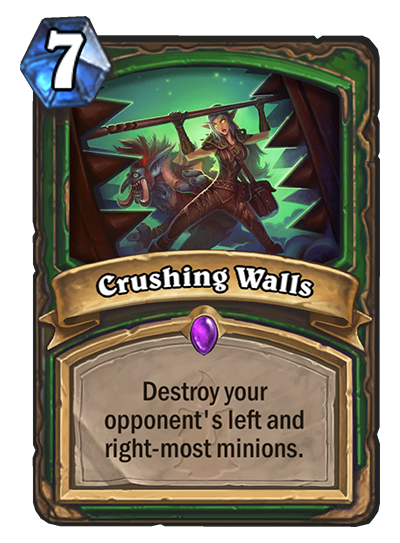 And anyone playing Wild is going to waste little time using this with Sylvanas Windrunner. 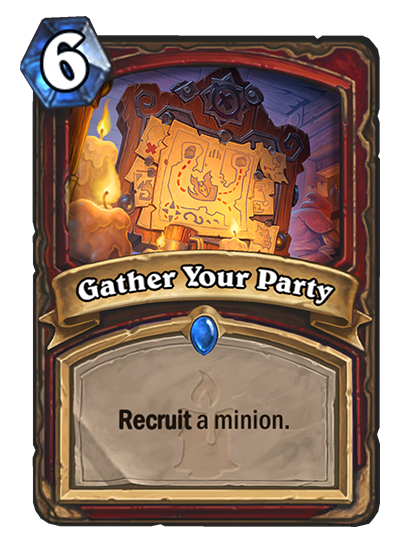 That's without even speaking about its solid 4/6 stat line, which is becoming more and more standard on good 5-cost minions. This is the first real big winner of the expansion so far and I would get used to seeing this guy a lot. Analysis: Drygulch Jailor's main function will be to replenish a Paladin's hand. The 1/1 Silver Hand Recruits can either be used right away until a greater option presents itself, or more likely, it'll be used for the later game. An emergency 1/1 Silver Hand Recruit can be buffed up later with Spikeridged Steed or Bonemare. Where Drygulch Jailor falters is with its weak 1/1 stat line. That alone makes it an inferior choice to Hydrologist, which arguably offers a better reward anyway. 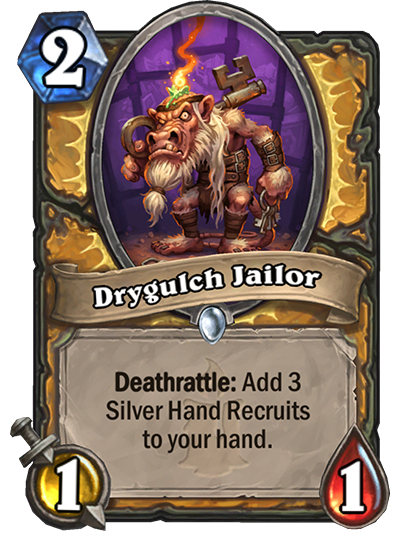 The Drygulch Jailor's stats and Deathrattle reward also make it a prime target for Priests and their Potion of Madness spell, so maybe don't open up to that kind of scenario and just don't play this guy. Analysis: Look out! It's Deathrattle Barnes, except this calls up a minion from your hand and not your deck. The Deathrattle effect does give Rogue players something to work with, allowing them to potentially fix their hand to such a point that they can trade in this minion and kill it to summon a 1/1 copy of that killer Malygos in their hand. It could also be a strong tool for Miracle Rogue, giving them a chance to bring out a mini-Gadgetzan Auctioneer to help replenish their hand. For now, this is a dead card, because Barnes is still hands-down a better choice. The immediacy of the Battlecry effect, along with Barnes' 3/4 stat line, are a better fit for Rogue. 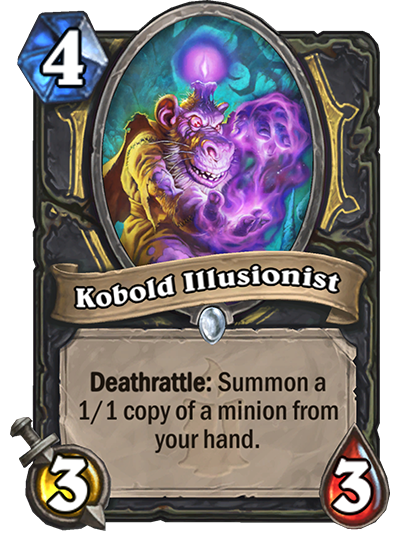 However, Barnes is supposed to rotate out of Standard in the spring, so maybe table the Kobold Illusionist for the time being. His time might still come. 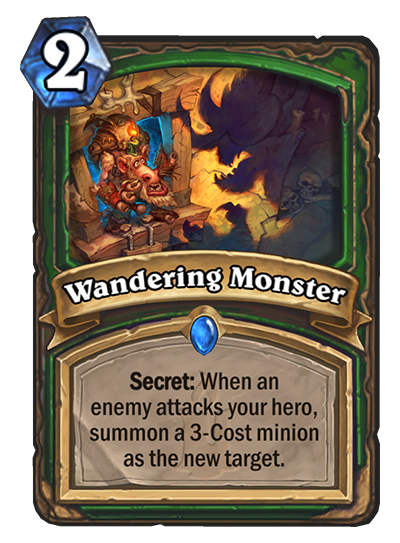 Analysis: Hunter secrets have usually been reliable, but this is one of the first ones to really depend heavily on RNG. Like many of the Hunter's other Secrets, this is a strong aggro deterrent, but the Wandering Monster's effectiveness depends almost entirely on the minion it pulls. At worst, it pulls out a low-health minion that dies immediately. So at that point, it acted as a Noble Sacrifice. But this has the potential for some shenanigans, since it can pull out a Darkshire Councilman, a Shaky Zipgunner, or potentially a Devilsaur Egg. That leaves a lasting effect and one that could swing the game early. Hunters who are already running Secrets in their decks have no reason not to add this, since there's little downside in running a Hero-protector like this. It should even play nicely with Professor Putricide. The card reveals have just begun, so keep visiting Shacknews for more card analyses. We'll also be breaking down the Legendary weapons as they come in. Look for those breakdowns to begin on Tuesday. Hearthstone's Kobolds & Catacombs expansion is set to release in December.